As seen on Season 1 of The Great Food Truck Race on Food Network, Stephen Domingue hit the streets of LA debuting his Gourmet Cajun food truck. GRILLING IS OUR BUSINESS AND BUSINESS IS FINE!!! In a battle of cheese and sauce, finally burgers and heavy metal unite in harmony. Making Architecture Digestible! Roaming LA, Austin (CoolhausATX) & NY (CoolhausNY) with gourmet, architecturally inspired hand-made ice cream sammies. 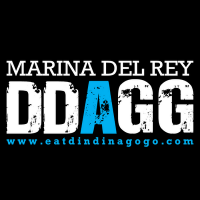 Creator of DinDin-a-GoGo & Proudly Reppin’ the SouthBay and LA with J-style Peruvian yumz since 09. Thanks for the L.O.V.E.! !